Spectrum picked up some unique products from entire range of products and categorized as Specialty filters for special application. Auto Roll filter units are available in a wide range of size and feature options. The filter uses an Industrial grade fiberglass media which automatically renews when prompted by a pressure drop based sensor. Along with pressure drop sensing the filter also has media run out alarm. The intelligent control panel can be placed besides the filter unit or can be integrated with the centralized building control. The unit is equipped with a totally enclosed thermally protected motor. 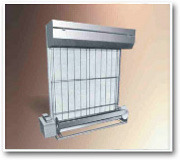 Spectra Auto Viscous filter is a self-cleaning viscous air filter using a rotating curtain of metal screen as the filtering media. Behind the filter media roll is an endless roll of oil drop eliminator. When the filter media is loaded and the pressure drop increases, a totally enclosed thermally protected geared motor moves the filter media and oil drop eliminator which pass through a viscous oil bath located at the bottom of the filter. The viscous oil cleans the filter media and the oil drop eliminator ensures that the oil is not carried into the air stream. The sludge collected in the oil bath needs to be cleaned periodically. The Spectra Spin Tube Inertial Separator is a high efficiency, low pressure drop, one-piece molded polypropylene air cleaner. Each unit contains 54 small tubes with stationary air spinners that impart a high radial velocity to the air at the inlet face. The resulting centrifugal force causes the dirt particles to move to an annular space from which they are removed by the flow of bleed air which is generally 10% of the total dirty airflow. The clean air is withdrawn through the center of the inner tubes out the exiting air face while the dirty bleed air is exhausted out the end of the filter element through bleed ducts. Multiple elements can be used in banks with bleed air ducts connected to a common bleed air exhaust duct. The Filtrair Drop Safe (DS) rigid filter is a pre-filter combined with very high efficiency coalescer. For application in air intake systems of Turbo machinery, in any environmental condition including - offshore, marine and in any climate - including tropical (high humidity). They efficiently remove airborne particulate matter along with snow, mist and fog, acting as a filter and a coalescer. A specially designed water drainage system drains out free water and air borne salt crystals. The Spectra Bag In Bag Out side loading isolation housing is designed to ensure that the service personnel are protected from coming in direct contact with the hazardous contaminants during filter change. Designed to withstand ±500 mm wc. Each HEPA filter cell is sealed against the housing frame and furnished with an individual door. A set of containment bags is shipped for use with each door. Once the initial filters are installed and the first bag attached, all filters, both dirty and new, are handled through the bag. Continuous, monofilament Filtrair's diffusion Media are synthetic fiber-based Nonwoven filter products developed and manufactured at Filtrair's own high - tech production facility. The filter media are constructed from selected high performance fine denier fibers in a gradient density multi - layering technique to ensure high depth loading with optimal lowest pressure drop performance. These media are thermally bonded and impregnated in full depth with a special adhesive coating to prevent any release of fibers and migration of paint - damaging particles larger than 5 microns due to vibration in the system, even under varying temperature conditions.